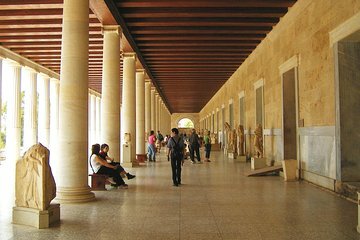 For elskere af klassisk græsk kultur og historie er et besøg på Agora i Athen et must. På denne rundvisning udforske templerne og en gammel koncertsal, følg i Plato og Socrates fodspor gennem sine marmorkolonnader og se de mest betydningsfulde genstande i Antikkens Museum. We loved this tour. It's valuable for a proper orientation to ancient Greece. The tour guide was excellent. It is so much better to have someone explain what you are seeing and putting into perspective than reading the posted signs or using a book. The guide was able to answer our questions about the Temple of Zeus, Hadrian's Arch, and all the ancient landmarks in, on, and around the Metropolis. You also get a nice walk through the gardens, and see the changing of the guard. I would advise doing this as early as possible in your visit to Greece.